A trendy spot where French elegance and excellence meets industrial chic. 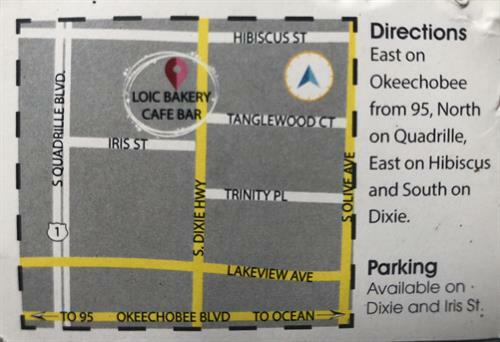 The man behind the French delicacies is Loic Autret, a well known & popular chef who mastered the Florida water and weather to bring handmade French croissants to West Palm Beach. The Cafe is open 7 days a week from 7- 4. The bakery offers breakfast and lunch featuring popular items like avocado toast, granola parfait, quiche, soups and salads plus wine, cheese and charcuterie in the late afternoon. The bakery is perfect for hosting events, plus caters to local businesses. Delivery availabel with advance orders. Enjoy fresh baked baguettes and a touch of France without traveling abroad. From 95, exit Okeechobee and head East. Turn left on Quadrille, Right on Hibiscus and Right on Dixie Hwy. The cafe doors face Dixie Hwy between Hibiscus Street and Iris Street.